Emory Writing Center will offer extended hours on select days to meet the extra demand for tutoring appointments during the final 14 days of the semester. The Writing Center schedule for final 14 is below (with extended hours highlighted). *SUN, 12/10, is the Writing Center’s last day of operation for fall 2017. Check WCOnline for extra tutor availability and to make an appointment, as we can only see walk-in clients on a limited basis. Please be reminded that we cannot tutor take home exams without the written consent of your instructor. Visit our website for our full appointment guidelines and policies. Congratulations to Alejandro Pérez and Monjori Mukerjee, first and second place winners of Emory Writing Center’s National Day on Writing poetry contest! Alejandro and Monjori’s poems were selected by a panel of judges from Emory’s Creative Writing Program. Their poems can be read below. Thanks to everyone who participated in this poetry contest and helped to make our National Day on Writing celebration a success! In case you missed it, you can check out more about the Writing Center’s National Day on Writing celebration here. with one foot in each. and your hand will freeze. Why I write, you ask? to thank the unknown for what I got. with my body and my uterus. Celebrate the National Day on Writing with the EWC! Are you curious about other writing systems? Are you interested in what the linguistic landscape looks like in other cultures? If you answered “yes” to any of these questions, then you are sure to enjoy this event! The Emory Writing Center will be celebrating the National Day on Writing from 12:00 pm to 2:00 pm in Centro Latino (AMUC 116). We hope to see you there! Even if you can’t make it to the live event, drop by the Writing Center (Callaway N212) between 12:00 pm and 5:00 pm for light refreshments. Be sure to follow us on social media, and tell us—in whatever language(s) you like—why you write! Meet the Tutors on Wednesday! Emory Writing Center tutors will be at the T1 lounge on Wednesday, October 11 at 8:00 PM to introduce the Writing Center and our services to Emory students. Come by, learn why the Writing Center is a great resource, have refreshments, and maybe learn a quick writing tip or two. We hope to see you there! 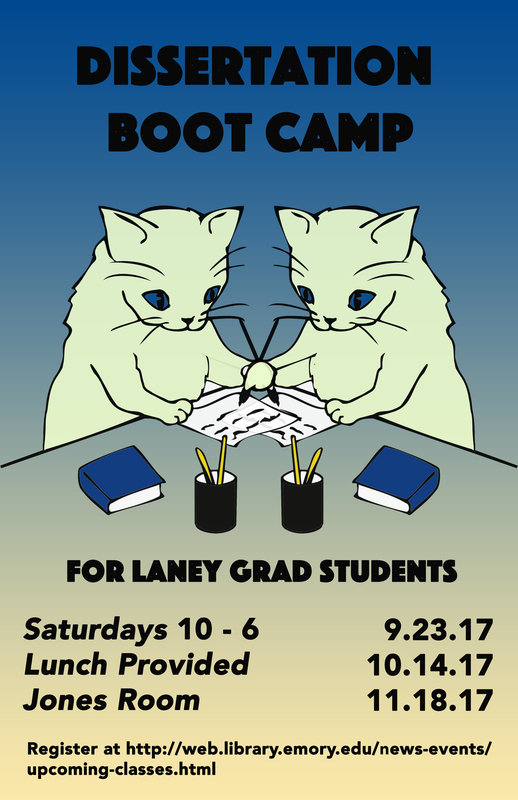 In partnership with the Laney Graduate School and the Woodruff Library Outreach and Education Committee, the Emory Writing Center is pleased to announce the 2017 Dissertation Writing Boot Camps. For more information and to register, please go to http://web.library.emory.edu/news-events/upcoming-classes.html. Spaces fill up quickly, so register today! Emory Writing Center will continue its distance tutoring pilot program during summer 2017. Distance tutoring appointments are reserved for students who are living or working outside of the Atlanta metropolitan area and local students who are registered with Access, Disability Services, and Resources (ADSR). For more information about the Writing Center’s distance tutoring program, visit our policies webpage or contact us at writingcenter@emory.edu. To meet the extra demand for tutoring appointments during the final 14 days of the semester, more tutors will be on duty during select hours in the Emory Writing Center. Please check WCOnline for extra tutor availability and to make an appointment, as we can only see walk-in clients on a limited basis. As always, please bring your assignment instructions and a hard copy of your paper (or your laptop if you are working on a digital project). Also, please be reminded that we cannot tutor take home exams without the written consent of your instructor. Visit our website for our full tutor appointment guidelines and policies. Representatives from Emory Writing Program’s Top-Off Fellowship will attend the Emory Writing Center’s recruitment information sessions next month. Come and learn the difference between the Writing Program’s Top-Off Fellowships and the Writing Center’s Completion Fellowships! Representatives from Emory Writing Center will also be in attendance to talk about undergraduate tutor positions. Attendees are invited to ask questions and discuss a typical day in the life of our fellows and undergraduate tutors. Two information sessions will be held; the details are below. Are you a strong writer? Are you interested in coaching other writers? Do you enjoy challenging, yet rewarding work? If so, join our staff! Emory students from all majors are encouraged to apply, and comprehensive training is provided. Go to www.writingcenter.emory.edu/students/work_for_us.html to learn how to apply. You can also attend one of our information sessions for potential tutors and fellows on Wednesday, February 1st, 4:00 p.m. – 5:00 p.m. and Thursday, February 9th, 4:00 p.m. – 5:00 p.m. in Callaway N-116. We hope to see you there!